So, I recently found a paper I wrote a few years ago and seeing how today is Halloween, I decided to post it. This is an academic paper, so it will be different from my usual posts. And it also contains spoilers. But, if you haven't seen this yet, spoilers is the least of your problems. 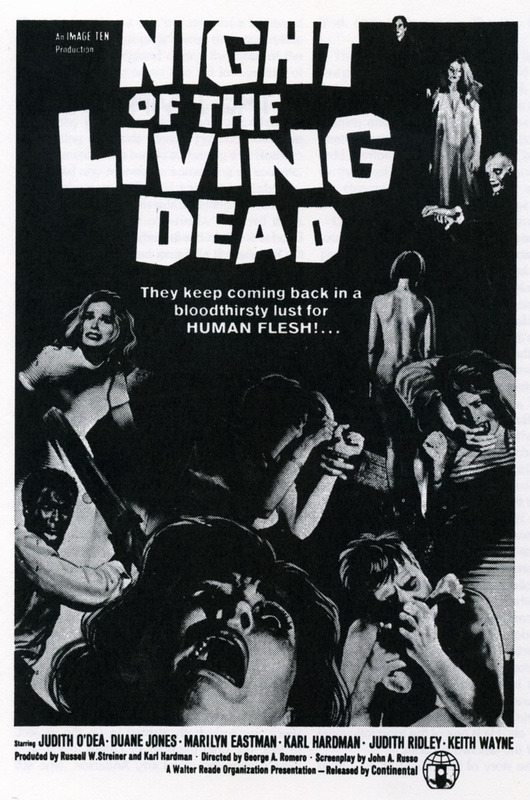 When George A. Romero’s Night of the Living Dead premiered in 1968, it revolutionized the zombie genre. Before Romero, most movies featured zombies that were a product of voodoo. They were usually slaves, being controlled by the person who put the curse on them (Roberts, The Zombie Movie History). The writers at IGN.com put it this way: “The granddaddy of the modern zombie genre...rethought what a zombie movie could be, removing the shambling creatures from the realm of voodoo...and placing them squarely in the backyard of middle-class America” (Linder). Ever since, zombies have been depicted as undead that feast on human flesh. By defining the rules of the zombie flick, Romero has influence all following movies of the type. But, Night of the Living Dead was only the beginning. Romero has since followed it with five sequels. The first three films in the series have all been remade. It has spawned numerous imitations. Even after 40 years, this classic still influences everything from blockbuster movies to low budget films to video games (Linder). Barbra and her brother Johnny go to visit their father’s grave. While at the cemetery, Ben and attacked and killed by a strange man, who then chases Barbra. Barbra flees and takes refuge in an abandoned house. She is shortly followed by another person, Ben, who also hides there. Together they begin to board up the house, to protect themselves from her attacker, who is slowly joined by other people acting in similar ways. Barbra and Ben are also joined by other people--The Cooper family and Tom and Judy--who have been hiding in the basement. They find a radio and television and discover that the people that have been surrounding the house are recently animated corpses that feed on flesh. Fearing the undead, Harry Cooper hides his family in the basement. The others continue to board up the house. In an attempt to escape, Tom and Judy are killed. Fighting over a rifle, Ben shoots Harry, who descends into the basement and dies. Harry’s daughter, Karen, becomes a zombie and kills her own mother. Meanwhile, Barbra sees her brother among the undead. Taken by surprise, she is pulled into the mob of zombies. As a last resort, Ben locks himself in the cellar, where he passes the remainder of the night. The next day, Ben emerges from the basement and is subsequently shot and killed by a posse, who confused him for an undead. While looking at the formal elements, the most obvious is the use of black and white film stock. When Night of the Living Dead was released in the 60s, most films were shot in color. The choice to use black and white stock was not an aesthetic one, but an economical one. According to Lee Roberts, Romero chose black and white because it was cheaper, keeping the budget down (Roberts Night of the Living Dead). Whether he intended it or not, this choice added a great deal to the atmosphere of the film. The lack of color emphasizes the emotions of the characters; they are scared and running out of options. Another important element was the use of camera angles. Romero constantly uses a Dutch angle. Many of the shots of Barbra running from the cemetery to the farmhouse employ this angle. After Barbra watches her brother’s murder and is subsequently chased by his attacker, her world is turned upside down. The dutch angle is also effectively used when Barbra tries to use the telephone to call for help and discovers that it has been disconnected. She is trapped without a form of communication. The unnatural tilt of the camera captures the unnatural events taking place outside the farmhouse. 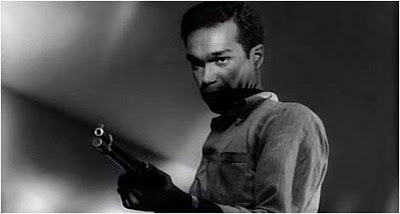 While Romero uses the Dutch angle as it is customarily used, he does the opposite with another angle--the low angle. Normally, a low angle shot represents power and authority and a high angle conveys vulnerability. But, Romero makes little use of the high angle shot (which would have normally heightened the character’s weakness), instead, filming many scenes from a low angle. One particular scene has Barbra standing in front of a fireplace while Ben gathers wood to secure the house. She is filmed from a low angle. Normally, this angle would depict her own strength. But, in this context, it seems more to emphasize her fear. As Ben boards up the house, low angles are also used. This does not focus on his power over the zombies, but rather his determination. Rather than affirming the characters’ themselves, the low angle strengthens their emotional states. Barbra looks more afraid from a low angle than a high one. Another element successfully used is the lighting. The whole movie uses low key lighting. This creates high contrast. The contrast between light and dark alludes to the contention in the film. The people in the farmhouse struggle to survive the invading zombies. These two forces battle against each other, just as the light and dark do in the lighting. Another contention occurs between Ben and Harry. Ben wants to stay and fight while Harry wants to descend into the basement to hide. The contrast between their plans is accentuated by the low key lighting. Low key lighting is also exploited to achieve a different effect. When Barbra and Ben first enter the house, there are no lights on. The house is completely black save a few blotches of light. It is not until they have been in the house for about 10 minutes that Ben turns on the lights, eliminating the darkness. In this first part, the blackness represents the unknown. They do not know who the zombies are or where they came from. Ben and Barbra do not know what they are going to do. But, Ben eventually has an idea and turns on the lights. He begins looking for tools to fortify the house. Turning on the lights and eliminating the shadows symbolizes their turn of action. Ben realizes the gravity of the situation and now knows what they must do. He makes a plan and follows it. This plan guides them just as the lights do. At the end of the film, the power goes out, throwing the house into the same darkness it was in at the beginning. But, this time the shadows coincide with the impending doom. Right after the lights go out, the zombies break through the boards and enter the house. Just as the shadows surround the characters, likewise do the zombies. This can most easily be seen in the last shot of Ben that night, before the next day. The zombies have invaded the house and Ben has locked himself in the basement. He is trapped; there is only one way in and one way out. Ben is last seen crouching in the middle of the frame, with shadows on either side, occupying about two thirds of the shot. The shadows are on the verge of collapsing on Ben. Upstairs, the zombies are on the brink of reaching him as well. An additional element that is used (though to a lesser degree) to create a sense of helplessness is the use of a frame within a frame. At first, the only connection to the outside world was the radio. Eventually, the group finds a television set. Now, they can watch the news and learn any updates about the events. But, all the scientists and police are framed by the television. They are the people who know and have the power to help. However, by framing them in the television, they are removed one step from Ben and the group. It distances them, placing help beyond reach. Towards the end of the film, after the night has passed, the police and his posse are seen for the first time without the frame. They are now close enough and able to help; although it is too late. I found this to be a really fun film. While I enjoyed it, I also feel torn by it. Some aspects of the film have aged quite well. At the same time, others have not. I thought the cinematography was quite good. Camera angles, movement, lighting all contributed to create an effective atmosphere. However, other aspects of the film seem outdated. There are many instances where it cuts to the group of zombies outside. They stand there for a split second, then they start walking. It is almost as if the director gave them their cue one second too late. I would assume that they would have been able to cut that first part out. But either way, it looks a little funny and distracts from the film. In another scene, Ben tackles a zombie and begins to punch it in the face. But, it is obvious that he is punching off to the right, to avoid hurting the other actor. However, no film is perfect. Even with its flaws, the overall film is a good watch. Some parts are genuinely creepy; such as when the zombies eat Tom and Judy and when the Cooper girl, Karen, kills her mother. The story is well written and the actors act as one would logically expect. While not as fast paced or gory by today’s standards, this classic will always be a great one to watch. Roberts, Lee. "Night of the Living Dead Broke the Rules of Moviemaking." The BEST Horror Movies, For the Discerning Horror Freak... 2006. Web. 05 Mar. 2011. <http://www.best-horror-movies.com/night-of-the-living-dead.html>. Roberts, Lee. "The Zombie Movie History - Everything You Need to Be a Zombie Master." The BEST Horror Movies, For the Discerning Horror Freak... 2005. Web. 04 Mar. 2011. <http://www.best-horror-movies.com/zombie-movie-history.html>. Linder, Brian, and Scott Collura. "Top 10 Zombie Movies - Movies Feature at IGN." IGN Movies: Trailers, Movie Reviews, Pictures, Celebrities, and Interviews. 11 Feb. 2008. Web. 04 Mar. 2011. <http://movies.ign.com/articles/851/851230p2.html>.